A Notre Dame student is unlike any other. Visit our campus to see faith based learning in action at our evening open house. 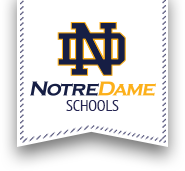 Tour classrooms, visit with sports teams, clubs and activities, hear from current students, parents, teachers and administrators. Learn about AP and dual enrollment courses, our growing arts program, bus transportation, tuition assistance, and so much more!